The “Earthquake Game” (OR WAS IT?!) had really only recently been turned into a thing, and the Interception Game certainly bore the mark of angels… but a game back-dropped by a towering inferno stretching higher than the upper-deck burning just outside the stadium? That’s the night it got weird—Sept. 21, 1996, the night of the fire. And it’s also really the only one of the occult-officiated games with at-the-scene, disaster-specific visuals. Forget that quick cut of the grainy seismograph they’ll show sometimes or random palm trees swaying in the breeze of Hurricane Ivan—if you want quality crazy Auburn-LSU rivalry b-roll, you go straight for the flames. 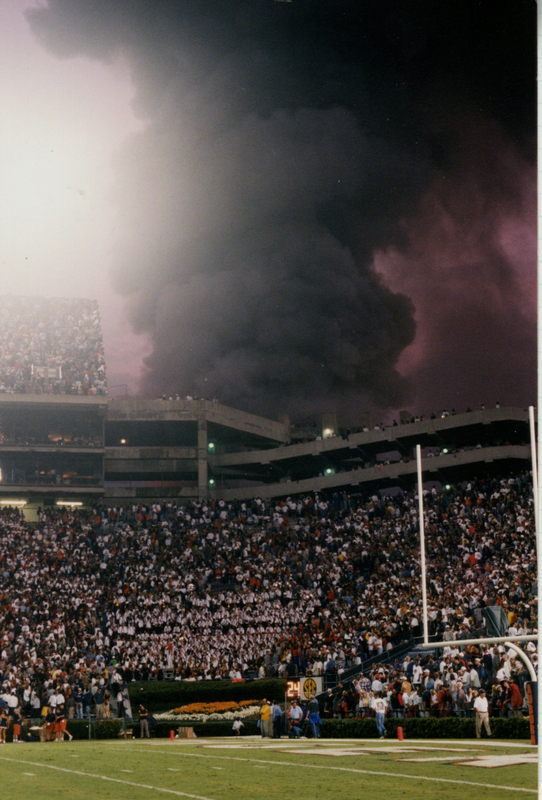 Orion (@SuiteAuburn) recently found not just one of the shots of the old Auburn Sports Arena (aka The Barn) burning to the ground, the victim of a alleged tailgater’s improperly extinguished grill, but a rare field-level photo of that hot, hot action snapped inside Jordan-Hare. Originally published August 23, 2012. I was at that game….. truly bizarre indeed! And then there ws the game when the sun came out, shined on the AU fans, and there was a miraculous comeback, led by the Blessed Individual. Speaking of the officiating in this game — and correct me if I’m wrong — if I recall, wasn’t there a pass in the endzone caught by Robert Baker that was ruled incomplete (out of bounds), and the replayed showed he was clearly in bounds? On the broadcast, it seems like I remember they even showed the divot mark left in the turf when he landed, which was clearly a foot or so in bounds. We were there also. It was a little scary not knowing what was going on. I was there, too. Carl Stephens, who was the PA announcer then, repeatedly announced that the fire was outside the stadium and that everybody should remain calm. This was very important because, as the previous post noted, it was hard to tell what was happening. I was there with my 9 year old son, who thought it was pretty cool! We were in that upper deck overlooking the fire behind us, and it was truly a surreal thing to watch! At one time, the flames were as high as the top of the deck, which was both scary and amazing to watch! Won’t EVER forget that night!!! WDE!!! I was also there in the opposite corner, so the smoke and flames was straight ahead. No one was watching the game for a few minutes. I also remember the intro to ESPN’s Sportscenter that night. The camera shot was about eye level with the concrete ramps lined with people looking at the field with the flames going behind them and the Sportscenter announcer proclaiming, “Woooo-weeee… Feel the HEAT of Sportscenter!”. Hilarious! Orion! Dan from 2004 UGA game via PT. Remember that? Hit me up on fb at /dan47kw!